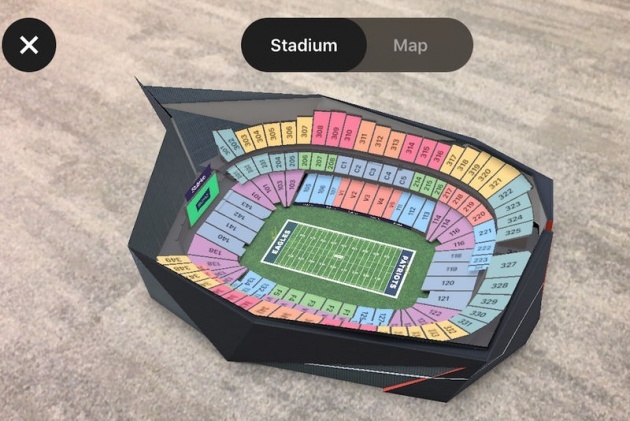 People looking to purchase Super Bowl tickets via StubHub's iPhone app will now see a new "AR" option that lets them bring up a 3D model of the stadium and its surrounding area. The idea, according to StubHub CTO Matt Swann, is to give ticket-buyers a way to better plan their Super Bowl experience well before they ever set foot in Minneapolis. Using the augmented reality experience, they'll be able to more accurately visualize where their seats are in relation to the rest of stadium, as well as check out locations of various parking garages and pre-game events in the surrounding downtown area. Though it's still early days for ARKit and augmented reality, Swann says StubHub is already looking at how they can bring similar augmented reality features to other types of events, like concerts, as well as additional aspects of the event experience. "When you think about adjacencies like parking, concessions, goods, there's all kinds of directions you can go with this. We know it's going to be a core part of the digital experience we're going to continue to invest in."